Is Apple Turning to Foistware Methods? "Engineers designed Safari to be secure from day one"
It rather sounds as though the Apple Engineers have a bit of a problem. However, there is more to this story than vulnerabilities. As Tashi reported in What’s Up Apple, I don’t want Safari, Apple is using their Software Update program to push the not so "secure from day one" Safari browser on people. Is the Apple market share doing so poorly that they are resorting to foisting their software on their customers? Is Apple taking advantage of the years the security community has spent telling people to keep their software up-to-date, hoping unsuspecting customers will click Next > Next > Next? Opt-in is the only way. The update process should be completely opt-in. The option to deliver software should never be preselected for the user. Offer full disclosure. The software company has a responsibility to fully disclose what its software does, and the customer should make the opt-in decision only after being given complete details about how the update process works. Offer updates only. Updates should be just that. They should apply only to software that the customer has already chosen to install. Don’t mix updates. Updates that are not critical should be delivered through a separate mechanism. Firefox 2.0.0.13 has been released. The fixes noted below have been incorporated in the update. If you do not have auto-update turned on, select Help > Check for Updates. If you need assistance, additional instructions for updating Firefox are available here. Following a long year and a half study, Scot Finnie named Online Armor 2.1 as the Best Firewall Software of 2008. Unfortunately Windows Vista users will have to wait a while longer. As far as I can tell, Tall Emu has not yet released a Windows Vista compatible version of the firewall. See Scot's report at The Best Firewall Software of 2008: Online Armor. References are provided below for Online Armor help and Matousec's latest report. Microsoft released Security Advisory 950627 - Vulnerability in Microsoft Jet Database Engine (Jet) Could Allow Remote Code Execution - on 21 March 2008. Microsoft is investigating new public reports of a vulnerability in Microsoft Jet Database Engine. Customers running Windows Server 2003 Service Pack 2, Windows Vista, and Windows Vista Service Pack 1 are not vulnerable to the buffer overrun being attacked, as they include a version of the Microsoft Jet Database Engine that is not vulnerable to this issue. At this time, Microsoft is aware of very limited, targeted attacks that use this vulnerability and is investigating the public reports and customer impact. Those in the United States can contact Customer Service and Support (CSS) at no charge using the PC Safety hotline at 1-866-PCSAFETY. Easter greetings to all WinPatrol users! Bill Pytlovany is offering a $10.00 discount to anyone who upgrades to WinPatrol Plus this Easter weekend. What advantages are there to WinPatrol Plus? R.I.D. was developed by BillP Studios to provide immediate detection of newly installed programs. This technology allows real-time detection without impacting system performance. For a one-time subscription fee, provide support for the future of an exceptional software, compatible with all versions of Microsoft Windows software from Windows 95 through and including Windows Vista. Take advantage of the special $10.00 Easter weekend discount today. Click the Ukrainian Easter Egg image below to go to the BillP Studios Order Center. Use the Coupon Code Pysanky when placing your order. Note to PayPal customers: Please send an e-mail to BillP Studios at support@winpatrol.com and provide your license information to receive the $10 rebate. It is official! Windows Vista Service Pack 1 (SP1) was released to the download center and Windows Update as well as to the download center on microsoft.com today. Note that this release only includes the English, French, Spanish, German and Japanese versions. In mid-April, Windows Vista SP1 will be released to Windows Vista customers who have chosen to have updates downloaded automatically and will be a much smaller download, advisable for people with only one computer to update or on a dial up connection. Note that you will need to have the prerequisites before being able to install SP1. Although the announcement indicated that SP1 would be released in mid-April to customers who have chosen to have updates downloaded automatically, apparently this has changed. Either that or different update settings (i.e., ask and let me decide as I have) started receiving the SP1 install offer via automatic updates last evening. I received it today. Being on dial-up, the 69.8 MB download is taking quite a while. I will likely have to leave it running when I head off to bed and see how it does on its own. For more information on what to expect, see Ed Bott's writeup: Want Vista SP1? Here’s what to expect. In particular, note the link to the Microsoft dedicated support page for Windows Vista SP1. It is rapidly approaching the income tax filing deadline in the U.S. As more families start using their home computer to E-file their tax return, it is vitally important to keep some important security aspects in mind. In the wrong hands, the information contained in your tax return could easily result in identity theft. Microsoft has published some steps to help avoid online tax fraud. If you are planning on E-filing your tax return, please do not take any chances. In the event you suspect you are a victim of tax fraud or identity theft, visit the links below to get help. Affected Products: Microsoft Office Web Components. Sun Java has released Update 5 for Java SE. Although I do not have Java installed on my home computer, I have updated the widely used tutorial, SunFlowers and SunJava Update. Is it any wonder the download is now over 15 MB? How much money is Google, Yahoo, Ask, etc. paying vendors to include a toolbar? We know from Bill Pytlovany the revenue is significant -- enough that he would have been able to retire comfortably by the end of the year. If you've followed Bill any length of time, you now it would take a lot of money to reach that "comfortable stage". 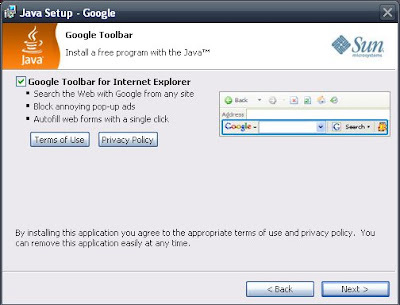 A friend sent me a link to an explanatory blog post that goes back to 2005 which discusses Sun's agreement with Google to include the Google tool bar with consumer Java SE downloads from java.com. As indicated by Dave's comments posted , he has not been offered the tool bar, as I have heard others say as well. I have no explanation as to what the installer is finding on the machines where it is not offered and continue to encourage people to follow the offline installation only from Java SE Downloads. Along with that recommendation is the reminder to read the installation windows rather than blindly clicking Next, Next, Next. With four new security bulletins scheduled for March 11, 2008, the anticipated security updates for March will be much lighter than they were in February. 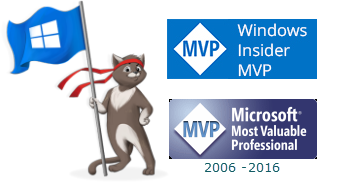 However, Windows Vista users should keep in mind the schedule for SP1 and check that all the prerequisites are installed. Three of the scheduled updates for this March are for remote code execution vulnerabilities in Microsoft Office. The fourth is also remote code execution but for Microsoft Office Web Components. 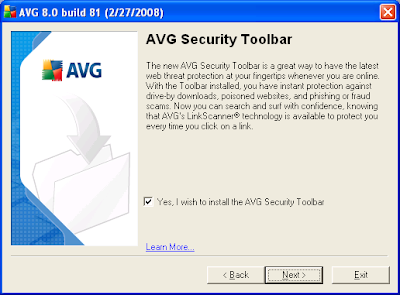 Grisoft, now AVG, released updated version 8.0 of their security software for licensed subscribers only. The "free for personal use" versions have not been updated yet. Included with the package of the licensed (read "pay for use") software is the Yahoo search bar. Granted, the Yahoo search bar does not have the same questionable reputation as the Ask toolbar. However, what message is AVG sending when their newly released Version 8 product includes the search bar pre-checked and disguised as a "Security Toolbar"? To make matters worse, the reports indicate the toolbar is installed even when the option to include the toolbar is UNchecked. Discussion in some communities is suggesting that the Yahoo search bar is easy to uninstall. In my opinion, that is already too late. Depending on the package home subscribers purchase, the cost goes from $35 to $55 (USD). That means that AVG receives not only the price of the subscription but also the fee from Yahoo for each installation, all at the cost to the subscriber.